He went on, I didn’t stop him, to describe the pre lubrication system, the electronic frequency control, the microprocessor-based controller for pre fault system, that it has the MX321 auto voltage regulator, 400 amp circuit breakers, 22 hole Cam-lok E10/6 panel that includes 4 male ground, 4 female ground, 8 neutral, 4 C/L each hot leg one, two, three and two Edison 20A duplex and one 100A Union connector with separate breakers! The best was the auto op instructions: “TURN ON POWER” switch to “RUN”. I had to know, so I asked this knowledgeable man if I could possibly see what the heck this generator was supplying electricity to! At once he took me inside where I was immediately shocked to see a huge set where it looked like circus people were being shot out of cannons and colorful powder was exploding everywhere. All around was a ring of very large bright lights and much cable. People everywhere. 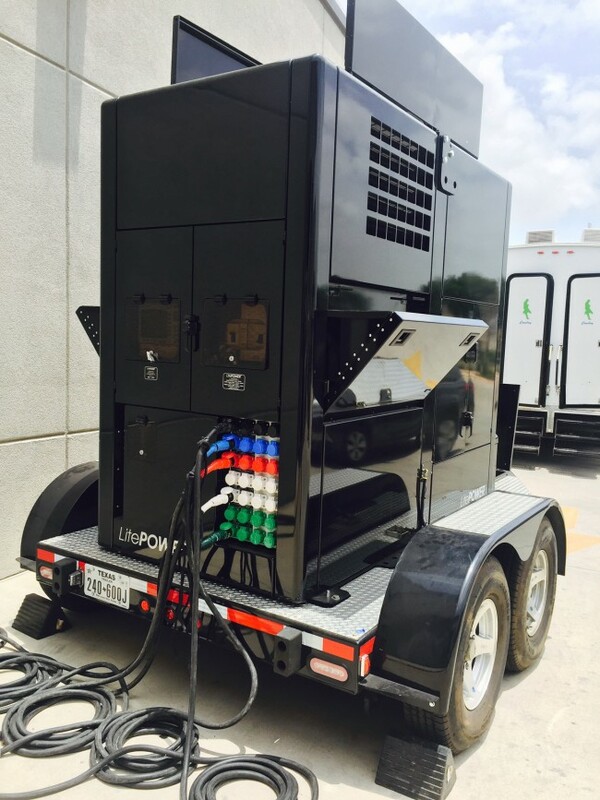 I was told that the amount of lighting fixtures being powered by the generator was several, ranging from 18000 watts , 9000 watts, 4000 watts combined of HMI daylight, accumulating an amperage load that this geni had no problem dealing with.